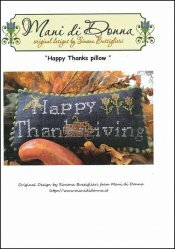 Happy Thanks Pillow [J1806] - $10.00 : Yarn Tree, Your wholesale source for cross stitch supplies. Cross stitch pattern by Mani di Donna. The turkey is baking. The mashed potatoes are getting smashed. The stuffing is getting mixed. The rolls are getting formed. The pies are getting baked. As we gather with our family & friends this Thanksgiving, the "Happy Thanks Pillow," would be a great addition to stitch into a pillow for the couch. Wishing you a wonderful Thanksgiving! Stitch count is 86 x 35.